Als vervolg op de succesvolle workshop ‘Do we Care? !’, werd Blossity geïnterviewd door Atlantis, het magazine van studievereniging Polis TU Delft. The way healthcare is organised in the Netherlands is currently under great debate. With an ageing population and the political trend for decentralising governments, new forms of cure and care need to be developed. What position does this bottom-up healthcare take in the development of urbanism? Atlantis joined Blossity and Michiel Brouwer in a conversation to find answers on how healthcare can be designed and what place it takes in our daily urban systems. 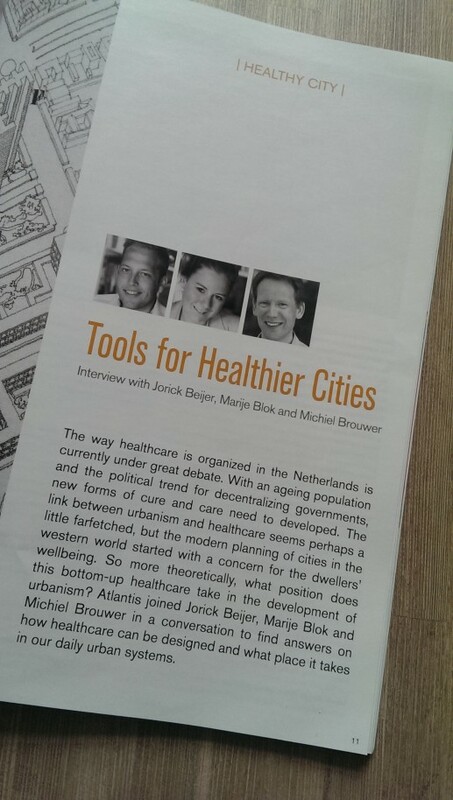 In het decembernummer werd het (Engelstalige) interview gepubliceerd onder de titel ‘Tools for Healthier Cities’.